But God did not forsake Jacob. His mercy was still extended to His erring, distrustful servant. The Lord compassionately revealed just what Jacob needed—a Saviour. He had sinned, but his heart was filled with gratitude as he saw revealed a way by which he could be restored to the favor of God. Wearied with his journey, the wanderer lay down upon the ground, with a stone for his pillow. 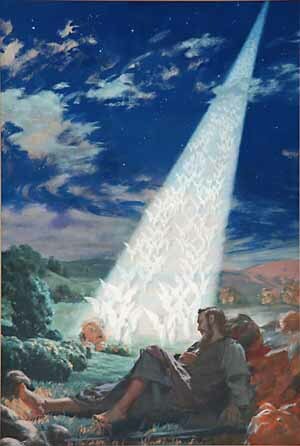 As he slept he beheld a ladder, bright and shining, whose base rested upon the earth, while the top reached to heaven. Upon this ladder angels were ascending and descending; above it was the Lord of glory, and from [p. 184] the heavens His voice was heard: "I am the Lord God of Abraham thy father, and the God of Isaac." The land whereon he lay as an exile and fugitive was promised to him and to his posterity, with the assurance, "In thee and in thy seed shall all the families of the earth be blessed." This promise had been given to Abraham and to Isaac, and now it was renewed to Jacob. Then in special regard to his present loneliness and distress, the words of comfort and encouragement were spoken: "Behold, I am with thee, and will keep thee in all places whither thou goest, and will bring thee again into this land; for I will not leave thee, until I have done that which I have spoken to thee of." Our time, our talents, our property, should be sacredly devoted to Him who has given us these blessings in trust. Whenever a special deliverance is wrought in our behalf, or new and [p. 188] unexpected favors are granted us, we should acknowledge God's goodness, not only by expressing our gratitude in words, but, like Jacob, by gifts and offerings to His cause. As we are continually receiving the blessings of God, so we are to be continually giving. In early times custom required the bridegroom, before the ratification of a marriage engagement, to pay a sum of money or its equivalent in other property, according to his circumstances, to the father of his wife. This was regarded as a safeguard to the marriage relation. Fathers did not think it safe to trust the happiness of their daughters to men who had not made provision for the support of a family. If they had not sufficient thrift and energy to manage business and acquire cattle or lands, it was feared that [p. 189] their life would prove worthless. But provision was made to test those who had nothing to pay for a wife. They were permitted to labor for the father whose daughter they loved, the length of time being regulated by the value of the dowry required. When the suitor was faithful in his services, and proved in other respects worthy, he obtained the daughter as his wife; and generally the dowry which the father had received was given her at her marriage. In the case of both Rachel and Leah, however, Laban selfishly retained the dowry that should have been given them; they referred to this when they said, just before the removal from Mesopotamia, "He hath sold us, and hath quite devoured also our money." Seven years of faithful service Jacob gave for Rachel, and the years that he served "seemed unto him but a few days, for the love he had to her." But the selfish and grasping Laban, desiring to retain so valuable a helper, practiced a cruel deception in substituting Leah for Rachel. The fact that Leah herself was a party to the cheat, caused Jacob to feel that he could not love her. His indignant rebuke to Laban was met with the offer of Rachel for another seven years' service. But the father insisted that Leah should not be discarded, since this would bring disgrace upon the family. Jacob was thus placed in a most painful and trying position; he finally decided to retain Leah and marry Rachel. Rachel was ever the one best loved; but his preference for her [p. 190] excited envy and jealousy, and his life was embittered by the rivalry between the sister-wives. The shepherd's life of diligence and care-taking, and his tender compassion for the helpless creatures entrusted to his charge, have been employed by the inspired writers to illustrate some of the most precious truths of the gospel. Christ, in His relation to His people, is compared to a shepherd. After the Fall He saw His sheep doomed to perish in the dark ways of sin. To save these wandering ones He left the honors and glories of His Father's [p. 191] house. He says, "I will seek that which was lost, and bring again that which was driven away, and will bind up that which was broken, and will strengthen that which was sick." I will "save My flock, and they shall no more be a prey." "Neither shall the beast of the land devour them." Ezekiel 34:16, 22, 28. His voice is heard calling them to His fold, "a shadow in the daytime from the heat, and for a place of refuge, and for a covert from storm and from rain." Isaiah 4:6. His care for the flock is unwearied. He strengthens the weak, relieves the suffering, gathers the lambs in His arms, and carries them in His bosom. His sheep love Him. "And a stranger will they not follow, but will flee from him; for they know not the voice of strangers." John 10:5. The apostle Peter admonishes the undershepherds: "Feed the flock of God which is among you, taking the oversight thereof, not by constraint, but willingly; not for filthy lucre, but of a ready mind; neither as being lords over God's heritage, but being ensamples to the flock." 1 Peter 5:2, 3. Paul says, "Take heed therefore unto yourselves, and to all the flock, over the which the Holy [p. 192] Ghost hath made you overseers, to feed the church of God, which He hath purchased with His own blood. For I know this, that after my departing shall grievous wolves enter in among you, not sparing the flock." Acts 20:28, 29. Said Jacob, "It was little which thou hadst before I came, and it is now increased unto a multitude." But as time passed on, Laban became envious of the greater prosperity of Jacob, who "increased exceedingly, and had much cattle, and maidservants, and menservants, and camels, and asses." Laban's sons shared their father's jealousy, and their malicious speeches came to Jacob's ears: He "hath taken away all that was our father's, and of that which was our father's hath he gotten all this glory. And [p. 193] Jacob beheld the countenance of Laban, and, behold, it was not toward him as before." Laban could not deny the facts brought forward, and he now [p. 194] proposed to enter into a covenant of peace. Jacob consented to the proposal, and a pile of stones was erected as a token of the compact. To this pillar Laban gave the name Mizpah, "watchtower," saying, "The Lord watch between me and thee, when we are absent one from another." Click here to read the next chapter: "The Night of Wrestling"